There is a great joke about hipsters that a friend of mine told me several years ago, back when I lived in the Bay Area. The joke is funny because it plays on hipsters’ disregard of, and disgust for, all things mainstream, their self-righteous contempt clutched to as a badge of honor to leverage themselves above the masses as connoisseurs of culture. In the last few seasons, the Arizona Fall League has taken on a life of its own, becoming the underground lounge full of up-and-coming prospects, the den where baseball hipsters, like Keith Law, sit and scout, then take to Twitter to tell the American masses about the players they will be worshiping in a few years. The parallel between the music hipsters and the baseball hipsters didn’t fully hit me until I saw a tweet from Law pop up in the middle of a playoff game, only to be bewildered to find that it had nothing to do with this game, but rather some prospect in the AFL game he was attending that day. This is not to make any judgments of right or wrong, just to point out that clearly, at this moment, a hipster culture had been created in baseball; one in which the possible, projected future was more important than the actual, present postseason. Needless to say, with this newfound emphasis being put on the yearly exhibition of prospects, the public’s desire for more information has grown accordingly. A strong performance in the AFL doesn’t win you a World Series, but it might put you on the cover of Baseball America, and motivate your team’s fan base to clamor for you to replace an underperforming veteran. Here at Yard Work, we wrote a couple of pieces last year showcasing the various Giants prospects coming up the ranks who we might see in Fresno, including the likes of Brandon Belt and Conor Gillaspie. We also had several offseason conversations with Jonathan Mayo— the MLB.com writer assigned to cover the minor leagues and the draft— to gain a better perspective on these prospects and on how well we could project their stellar performances in the Fall League towards future success. 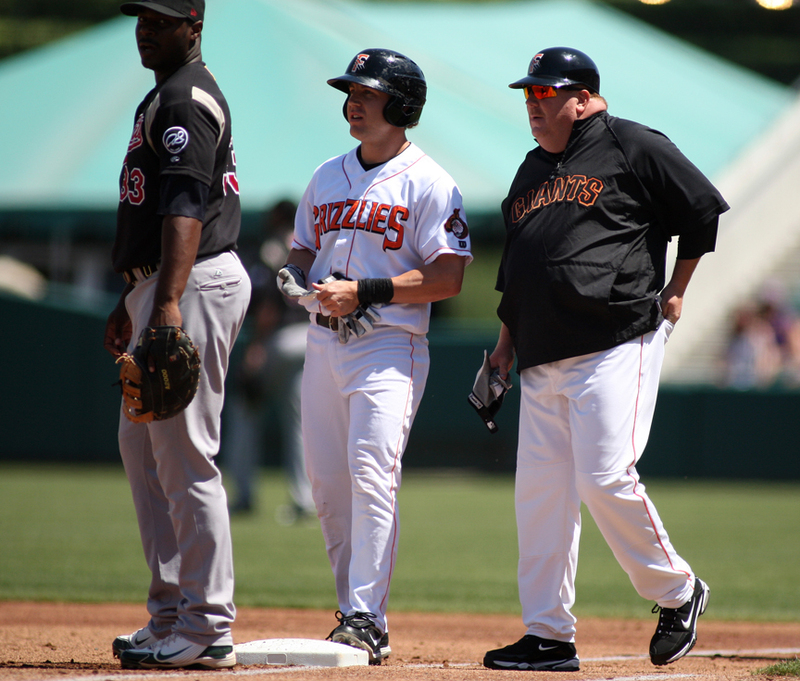 This year I found, to my delight, that 2010 Grizzlies hitting coach Ken Joyce was serving as the hitting coach for the Scottsdale Scorpions, the AFL squad for which the Giants prospects play. Recent top draft picks Gary Brown and Joe Panik are joined by the likes of 2011 Grizzly and Giant Brandon Crawford on that Scottsdale squad. And because of the collective structure of the AFL, in which each team is comprised of prospects from five different organizations, they all wear the same uniform as uber prospects Bryce Harper (Nationals) and Mike Trout (Angels). I caught up with Joyce the other day to get his thoughts on all of the above. 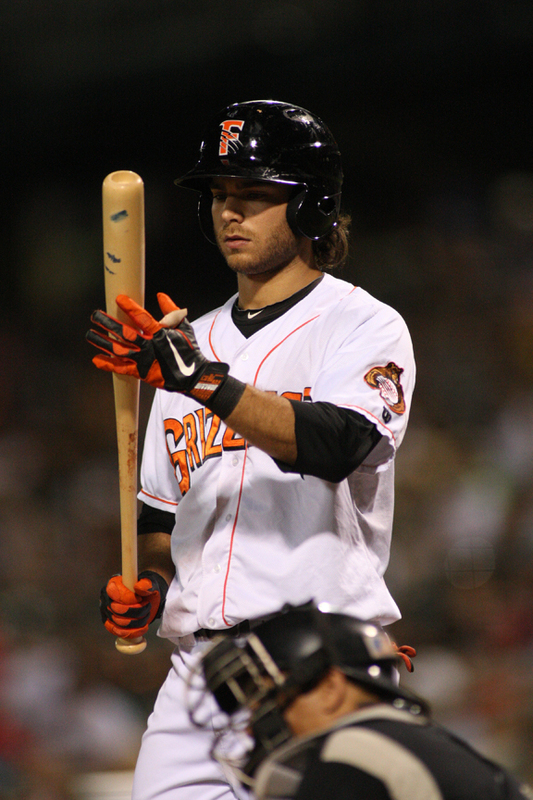 Yard Work: Brandon Crawford is an interesting case as a guy with Major League time playing in the AFL. Is this the first time he’s played for you, and what have you been working on so far? Ken Joyce: I’ve actually seen him before, since I had him in the instructional league last year. The biggest thing is we’ve simplified everything. A couple years ago in Double-A he was swinging the bat very well, but he got a little too technical, was trying to do too much. So we just focused on getting him in a good rhythm. He has been on fire, swinging very well against both righties and lefties. Plus, he’s kind of taken on a leadership role for these younger guys. YW: You also are getting an up close look at Joe Panik and Gary Brown. What are your first impressions of them? KJ: I’m very impressed with Panik. He’s a very mature young man, a little ahead of his time. Just talking to some people in the [Giants] organization, he reminds a lot of people of [Buster] Posey in his demeanor. Now it’s just a matter of adjusting to each level as he moves along. The fact that he’s [in the AFL] shows that they think very highly of him. He hit his first home run for us today. Overall his performance hasn’t shown up in the numbers, but he’s exhausted. He’s been going pretty much for a full year straight, so it’s probably the most baseball he’s ever played in his life. As for Gary Brown, I saw him a bit in Spring Training, but this is my first time really working with him. I think he’s fatigued a bit, too, it’s been a long year. The key for him is not getting caught up in the results. Two years ago Posey hit about .220 in this league and was in the Majors the next year. In my opinion, that is actually good for you— we’d rather have you fail here than in the big leagues. Browny’s got a very good attitude about it, he’s just been pressing a little bit mentally. But defensively, he’s as good as anybody here. YW: What have you seen out of Bryce Harper and Mike Trout, arguably the top two prospects in the game? KJ: They are both very talented individuals, I mean their raw talent is off the charts. I think they’re dealing with some of the same issues as Browny, that it’s just been a long year for them. They’ve been better lately, though. YW: Does it take some of the pressure off of the Giants prospects to know that guys like Harper and Trout are more in the spotlight? KJ: It takes a little bit of pressure off our guys, but at the same time, it means more people are coming to see them play every day. YW: Have any other guys stood out to you that maybe the general baseball public is unaware of at this point? Is there anyone to keep an eye on the next couple of years? KJ: I’ve been real impressed with two of our catchers. Derek Norris (Nationals) has been swinging the bat real well. We saw him in Harrisburg this year where he put up some power numbers in Double-A, but the average was low. He’s made some good adjustments since then. Dan Butler (Red Sox) has also been impressive. YW: Any other Giants prospects to look out for? KJ: The pitchers have done a good job, Austin Fleet especially. He’s got two wins, and has given up only one run so far. Stephen Harrold has closed out a couple games for us, too. The young kids have very good arms and have done a nice job, even getting themselves out of pressure situations. YW: Do you have other impressions from the AFL to share with the folks back at home? KJ: It’s just a great opportunity for these guys to develop. 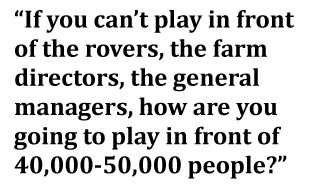 After all, if you can’t play in front of the rovers, the farm directors, the general managers, how are you going to play in front of 40-50,000 people? As for me, I’m loving it down here. It’s been good times, working with a good staff. It’s been good to see the rovers that we see throughout the year come through.